Foxtrot Alpha’s contacts in Europe have noticed some interesting movements heading west out of the Middle East. Apparently, five Israeli Air Force F-15C/Ds and five F-15Is, along with five Jordanian Air Fore F-16s, have been dragged across the Mediterranean to Lajes Field by Israeli Air Force KC-707 Tankers. The jets are on their way to participate in Red Flag 15-4 at Nellis AFB. “Departing Israel on the morning of August 9th was a flight of Israeli Air Force KC-707 tankers accompanied by 5 Ra’am F-15 Eagles. It marked the beginning of a long flight to Nellis AFB, Nevada, where the Israeli AF will be part of Red Flag 15-4. IAF 101 flight made the 7 hr+ flight supported by other IAF tankers already prepositioned in Spain to meet the thirsty jets and get them to Lajes Field, their transit airfield. This would be the first of three legs before finally making it to Nellis. IAF 101 with Ceetah (Cheetah) flight of five Eagles safely arrived on the Atlantic staging post late in the afternoon. 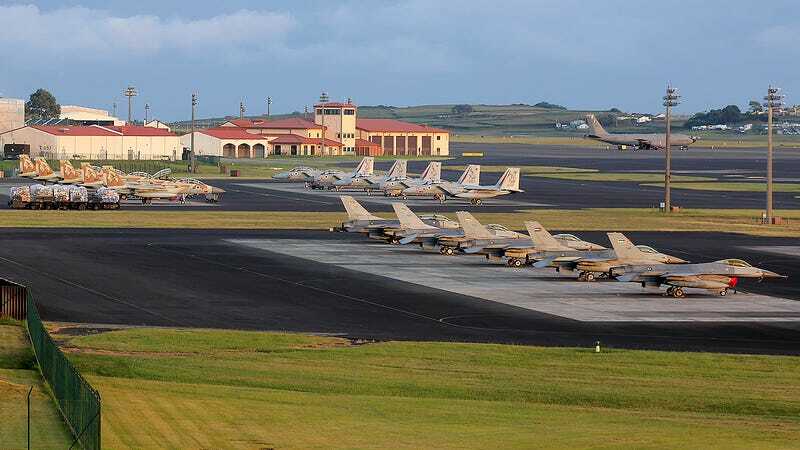 Lajes Field, which is located in the central Atlantic Ocean, is a common stop-over for military aircraft traversing between the U.S. and Europe and beyond. Although Israel and Jordan are security partners, having Jordanian F-16s ferried around the world by Israeli tanker aircraft, and alongside IAF F-15s, seems to indicate a new level of military cooperation operation between the two nations. This development comes shortly after the news that Israel has donated AH-1 Cobra attack helicopters to Jordan to be used for border security and against ISIS threats. The inclusion of Jordanian Air Force F-16s in exercise Red Flag comes as the country’s air force is locked in an ongoing battle against ISIS in Syria and as many in Washington call for increased military support for their anti-ISIS campaign. Jordan relies on a force of second-hand F-16s, some of which are upgraded to Mid-Life Update standard. Still, a lack of targeting pods and precision guided munitions has hampered their efforts against ISIS. With Israel now retiring some of its older F-16 force, it will be interesting to see if some of those aircraft end up in Jordanian hands. The Israeli Air Force’s appearance at the upcoming Red Flag, which will run from August 17 to the 28th, will be Israel’s first in the better part of a decade. It comes at what is widely referred to as the lowest point in U.S.-Israeli relations in decades, mainly due to the Obama Administration’s staunch support for the Iranian Nuclear Deal, a move that has brought Israel’s interests more inline with those of Sunni Arab states than ever before. Israel and Jordan’s participation in Red Flag has not yet been formerly announced, but we will keep you posted as to how the exercise progresses in the coming weeks.